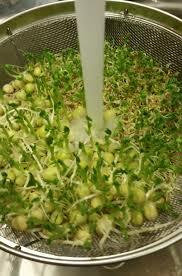 Sprouted baby seeds are power houses of the nutritional spectrum. They contain all the latent energy and genetic information required to turn tiny seeds into full-fledged plants. An indoor sprout garden is an easy way to harness the energy of these vital living foods. Sprouted seeds are the finest source of nature’s enzymes – the electrically charged proteins that drive all life processes. A diet rich in enzymes will speed healing, lift energy and enhance all aspects of health. Activation of the enzymes contained within living seeds is like flicking the ‘on’ switch. Absorption of all contained nutrients is enhanced, driving them into tissues and metabolic pathways where needed. These nutrients are enclosed in a power packed parcel designed to turn each small seed into a fully mature plant. These become available to us rather than being utilized in fueling the plants own maturation. Enzymes enhance digestion and the absorption of all nutrients. Pre-digestion with enzymes takes place in our upper stomach. 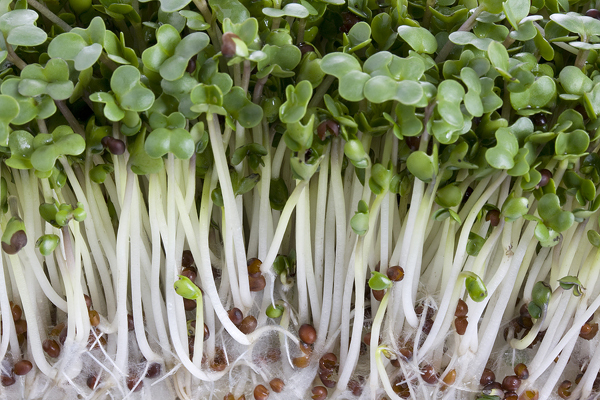 Eating enzyme-rich sprouts lightens the workload on our digestive tract. The result is more nutrients in with less energy expended. There’s nothing fresher than a baby plant harvested directly from its tray or bowl. Even better than a plate of greens from your own garden, sprouts are still alive as we eat them. Their life force is transferred directly to us. A small bag of seed will provide enough mature sprouts to grass an entire football field. For the price of a loaf of bread you can nourish your entire family for months with these small seeds. With organic soil or just water alone, sprouts are easy on the environment. Seeds need to be delivered, but the process does not require any refrigerated transport trucks to get them to the supermarket. Recycle the soak water- garden plants love it, and the roots and soil from baby greens make fantastic compost. You can also let some go to seed and save for your next harvest. As sprouts green they develop chlorophyll, which is how plants trap the sun’s energy and transform it into oxygen. This increases the oxygenation of any environment they are growing in. 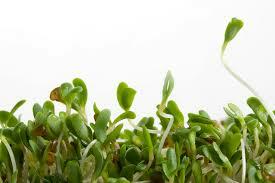 As the most crucial element to life, sprouts are doing you good even before you eat them. The satisfaction of growing your own food is palpable. Just pick yourself a bounty from you own indoor garden. It’s quick, easy and incredibly nutritious. Just a couple of minutes a day can provide abundant superfoods! 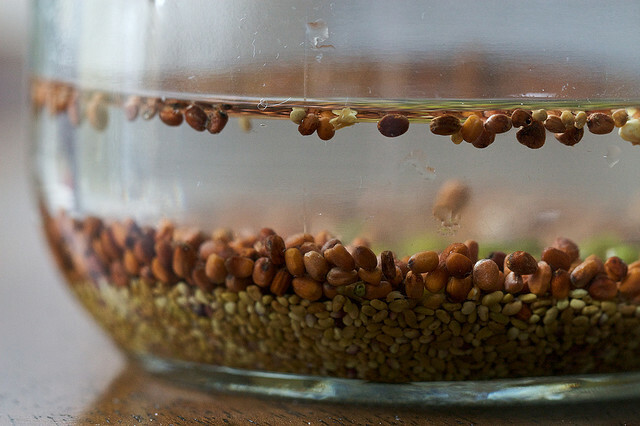 Just how easy is it to sprout seeds? Soak the seeds over-night. Make sure you use at least twice as much water as seed. Soaking stimulates the release of their enzyme inhibitors and activation of enzymes. It is this combination which enhances digestion and boosts nutrient availability. Use a bowl or jar which suits the amount you wish to grow. In warmer weather you will need to change the water once or twice if soaking for 24 hours. Sprouting the seeds enables the enzymes to get to work on pre-digestion, breaking proteins down into amino acids, fats down to fatty acids and complex carbohydrates into simple sugars. This reduces the load on our own digestion and further enhances absorbability. Rinse them two or three times a day throughout the process to keep them fresh. Again, the weather affects this and more is needed in the heat and humidity of summer. The heat of summer also speeds up their growth as well. The seeds that are sprouted for just a few days in indirect sunlight stimulate the production of chlorophyll, enhancing their cleansing and oxygenating properties. These young green leaves are some of the most powerful foods available. Water two or three times a day and allow to drain.